Multiple benefits (adaptogen properties, anti-anxiety effects). Supplement that helps improve capacity for work, learning and memory. Traditionally used to boost sexual vigour. Rhodiola rosea is a perennial plant which grows on the sandy, rocky, cold and dry mountain slopes of Siberia. Its medicinal use dates back to the Greek doctor Dioscorides (77 BC). According to tradition, it has the power to increase stamina, longevity, sexual vigour and cognitive ability. The first scientific studies to support these applications came from Russia and Scandinavia in the 1960s. Since then, Rhodiola rosea has been considered one of the leading adaptogens (substances which have a general, non-specific effect on increasing the body's resistance to various forms of stress) in the same category as ginseng, eleutherococcus and ashwagandha. Traditionally used to stimulate sexuality, rhodiola has been studied extensively in an effort to better understand its therapeutic properties. In the 1960s, several Russian and Scandinavian scientists named Rhodiola rosea as one of the major adaptogen herbs, a group which also includes ginseng, lapacho, Eleutherococcus senticosus and Schisandra chinensis. All these plants have the particular feature of being able to increase the body’s general resistance to various stress factors. This means they meet the body’s needs and help it protect itself, so enabling it to withstand stress. Such effects may, for example, take the form of regulating body temperature, blood pressure, and the nervous, hormone or immune systems. The specific modulatory response activated depends on the particular stress factor involved. Rhodiola is primarily associated with protecting against stress factors such as the cold or radiation. improve cognitive function such as memory, mental arithmetic, concentration, visual and auditory perception. 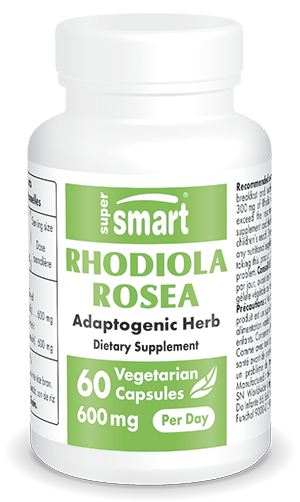 Our Rhodiola rosea supplement has thus been developed using a number of scientific studies, as described in our blog article: 10 good reasons to take rhodiola. In capsule form, it is produced using a standardised Rhodiola rosea extract, with each capsule containing 300mg of extract. The recommended dosage is two capsules a day to be taken before breakfast and lunch. This dosage can be adjusted in line with your therapist’s advice.